Right after I launched the blog, I struggled with the realization that I am broadcasting my efforts in good works to the world. That instead of opening up my heart more to my neighbors, and concentrating just on that, quietly, and secretly… that instead, I set myself up to give publicly, which could very well lead to the equivalent of taking a daily dose of pride pills. I’m not in need of any more selfish pride… While wrestling with these thoughts I ran across words like, “clanging gong” and “pharisee” too frequently for my comfort. Was God trying to tell me something? I prayed and struggled with this for quite some time. I spoke with my husband, and with friends, then finally set up a time with my priest to specifically discuss this. He encouraged me to continue the blog, and reminded me that absolutely every good thing we do can be a source of pride and temptation. The key is our response–it’s how we internalize a compliment or a word of praise. It’s whether I allow prideful thoughts to seep in and corrupt this fun experiment I’ve embarked on. The photo of the loaf of bread above is a fairly true portrait of how things have gone these last eight months. Round, edible, almost ugly, but sanctified… For this particular batch I intended to mix and mold the bread in the evening, but forgot about the mix and found it in the morning, overflowing the bowl I had started it in. Rescue mode. I reworked the dough, revitalizing the yeast with a bit of new flour, then molded and finally baked the bread. 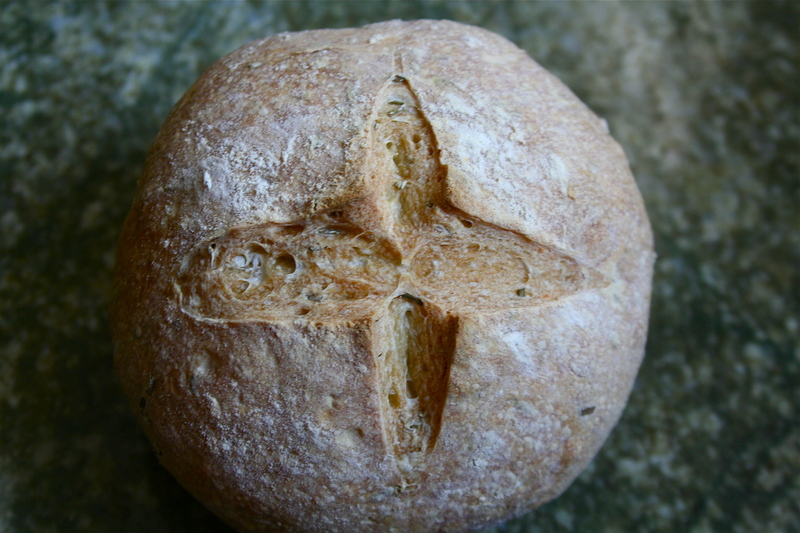 Overall the two loaves of rosemary bread came out fine, even give-able, sanctified by the prayers kneaded in and the cross scratched into the crust, but not beautiful. Certainly not beautiful. Beauty is an ultimate goal of mine each day: Can I be beautiful in the way I act toward my children, toward my husband, toward those I encounter when I’m out and about? Can I bring some beauty into our home, for us to behold and admire, which might lead us to praise God? Can I be beautiful in my prayers, in the way I work, in how I answer the phone and respond to email? There’s a whole layer of my life that I’ve intentionally left out of this blog. I’m hoping to inspire others, not to depress, and so I’ve often written a post these last few months, then deleted it. From January until June I underwent some unexpected trials and I chose not to share them with you. I couldn’t see what good would come of my complaints. But now that I’m on the other end of the struggle, I can see some of the learning, with hopefully more to come. I have struggled with a thyroid condition for fifteen years. It’s not terribly difficult to control and I’ve been on an even track for a long while now. But in January, my pharmacy accidentally gave me the wrong medication. For three months I slipped–lower, lower, lower, lower, lower… All the while Lent was pressing in on me, and I struggled to stay afloat. I thought I was raging one of the most difficult spiritual battles of my life. It’s true, I was. For I believe that your body, and mind, and your soul are all interrelated and share in the task of keeping one sane and healthy. But this battle wasn’t solely spiritual, as I’d thought. On Holy Friday I got a call from my doctor. Your thyroid numbers are really off, Jane. Really off. Deadly off. I had never been so relieved to hear such bad news in my life! During this time when my body was sinking further and further into non-activity (when your thyroid stops working your whole system slows, just like yeast does when you stick it into the fridge! )… I was able to keep baking! Baking and giving. When I had very little energy to even smile, or stay alert while driving, God somehow gave me what I needed to reach out and do something for others. This was a huge encouragement to me, and proof of God’s mercy on me. My numbers were so low that I should have been sleeping almost all the day through, like a little newborn… Many scary symptoms began to show their heads, but I was given the strength to homeschool my daughter, to traipse my kids back and forth across town when I was half asleep, and to not crack into a million pieces. So, here I am, feeling human again, writing again, smiling again, and so very thankful for my returned health. And though living the perfect day, or making the perfect loaf of bread is a rarity, maybe even an impossibility, it’s worth it to keep pressing forward, asking God’s help all the while. You never know what sort of life secrets you will learn when you’re in the midst of struggle. I’d love for you to share some of the secrets you’ve learned. gotta run; bread’s on the rise. This entry was posted in On Giving, On living and tagged beauty, boules, reflections, sanctified, thyroid by janegmeyer. Bookmark the permalink. I am glad that your health is returned, and I pray you continue to thrive. This is a lovely post, Jane. Thank you for sharing in all the ways you do. I’ve been down that dark road of hypothyroidism. You’re right it does effect everything. What a miracle that you were able to keep baking everyday – I know how hard that must have been. In terms of spiritual life and trying to inch one’s way toward the Kingdom of God, it is tricky being a writer — even if you share not only what you’ve done that is praiseworthy but write about your failures, shortcomings and outright sins. Pride can make use of just about anything we do. Don’t put your light under a bushel basket, we’re told, but also told not to let our right hand know what our left hand is doing! It makes me feel like the Levis logo — a pair of jeans being pulled in opposite directions by two powerful mules. PS Would you send me a slice of the bread in the photo? This was a lovely post that I will forward to my Facebook page as I have done with several of your posts. Your struggle has made me think deeply about what I post and share on-line and how I must be sure to pray for God to “check” my pride. As for your writing, I have never sensed any pride whatever. When reading your “adventures in giving” I am completely absorbed by your encounters with neighbors and your spiritual growth as you experience these encounters. You have inspired me to share my own loaves of bread which is now possible due to fewer children in the home to consume it all. And I did try. I’m not sure what the result will be, but it was an interesting effort in waging a war… I am not a spiritual warrior, just a little baby willing to do a bit of sparring now and then, but with God’s help—-so much is possible!!! It’s late, and I have a visitor in the house… I feel I could write for hours about this, but, alas. I’m glad you wrote about your struggle, Jane. I also struggle– with what I write in my calligraphy newsletters. On the other hand, I am spurred on in the struggle to keep making progress, in humility. It used to be that when I saw my failures I wanted to give up or beat myself up. More often now, I feel grateful that God is revealing it to me so that I can receive His grace to be transformed. You’ve inspired me. I have baked bread for many years for my family and I give it away when I can, but I live way out in the country and don’t always have someone nearby to give it to. Still, there are opportunities. I like it that you are using your bread making/giving as ministry. It surely is. What a blessing. Thanks for sharing with us.